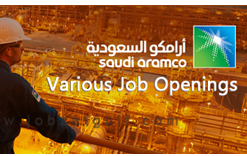 Saudi Aramco - the state state-owned oil company of the Kingdom of Saudi Arabia - is a fully integrated, global petroleum enterprise and a world leader in exploration, production, refining, distribution, marketing and petrochemicals manufacturing. It manages the world's largest proven conventional crude oil and condensate reserves of 260.2 billion barrels and the world's fourth-largest natural gas reserves of 288.4 trillion standard cubic feet. Saudi Aramco is also among the top producers of natural gas, maintaining the fourth-largest natural gas reserves in the world. Client Interview on 5th April 2017 at Chennai Candidates should have 5-10 year experience I relevant field.